All supplies and surface will be provided. 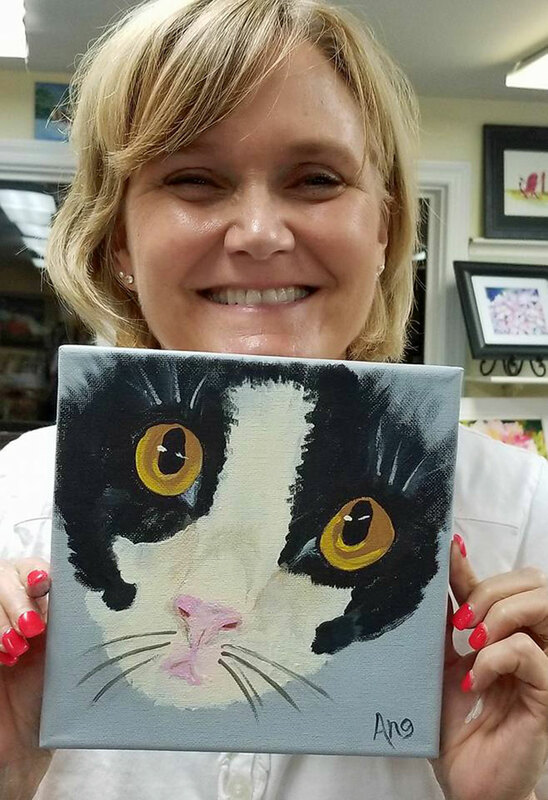 Come join us for an evening of fun where you will paint the face of your own cat on an 8×10” canvas. Don’t have a cat? Purr Partners has many kitties you can paint. No experience is needed, just the desire to enjoy the experience with friends. Bring a photo of your cat face for coloring. We’ll use a pattern for the face so no drawing is required. All supplies and surface are provided. And we’ll party, so bring a bottle of wine and a snack to share. Proceeds from our workshop go to Purr Partners Feline Rescue for the benefit of our cats. Ladies, and gentlemen, start your engines. Your creative engines that is. 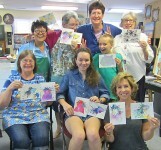 It’s the last week in Aug, kids are returning to school, and there’s art in the air. In the studio too! I hope you have all had a good summer with lots of fun, family, and friends. 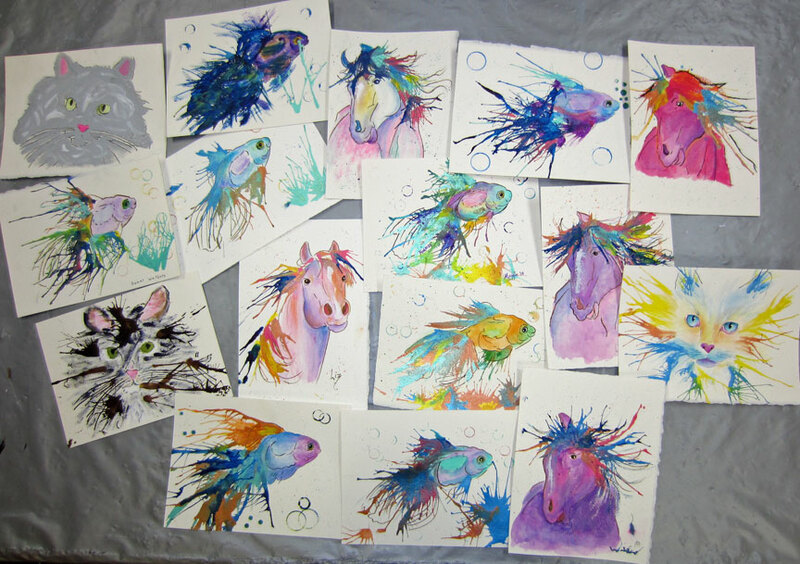 For those of you have had challenges this year, I sending positive thoughts and looking forward to having all of you back to painting with us again. We have a new supply of Americana and Traditions paints and the new DecoArt French stencils. The Chalky Finish paints are in stock with lots of color choices. We have lots of art experiences planned for this fall including weekly classes, workshops for all ages, and seminars. Wed am and evening classes resume in Sept with new and exciting projects planned. You can find more details on the web site but here are some of the upcoming highlights. Tue am open class: We’re open for class on Tue am as usual with opportunities for you to make up a missed classes or work on a project of your own with some assistance from me. 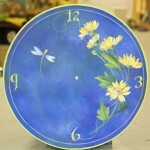 Also if you are wanting to start your painting experience with us, we’ll work you into our Tue schedule. 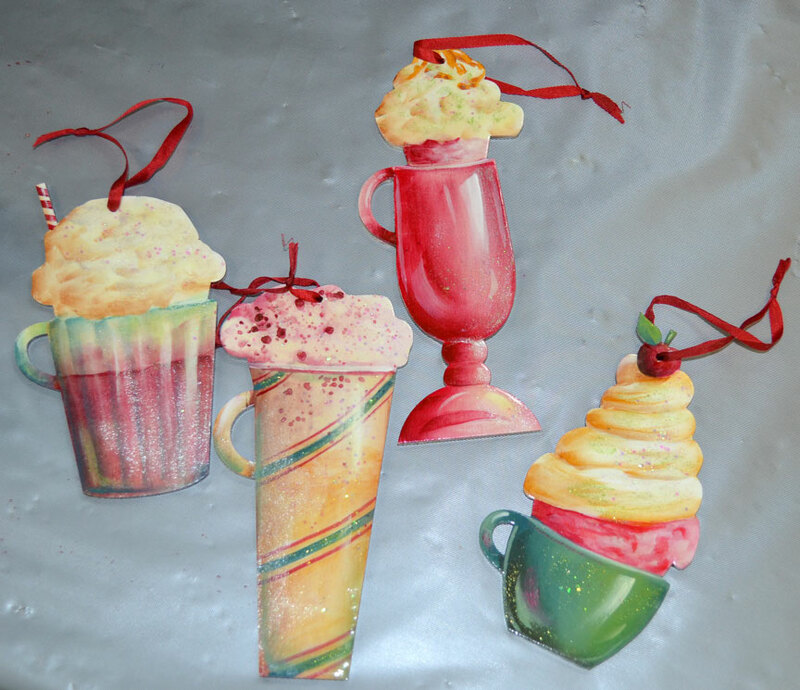 Please contact me to get started with Decorative Painting Basics. 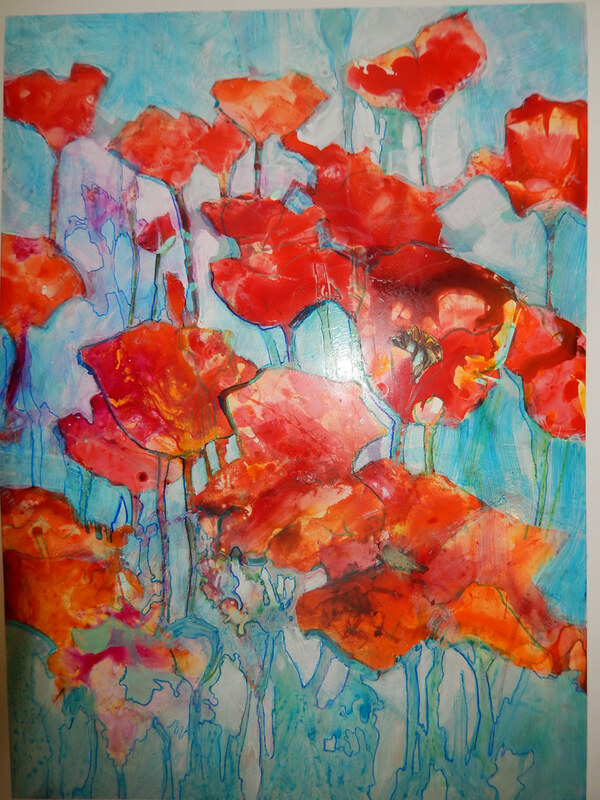 If you just like this painting and want to paint it, you can do that on Tue am also. 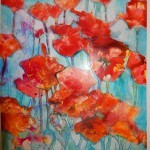 ArtFling: Gail is packing her bags and will be here ready for some mixed media fun on Fri, Sept 5. I’ll take over on Sat to continue with our endeavors. If you are not registered yet, contact me quick! There are supply lists on line and you can register there too. Sodas and Sundaes Workshop: Join us Sept 27th for a 4 hr workshop painting these colorful ornaments. Could be for your holiday tree but just too darn cute not to keep out all year. Register now! Halloween cat workshop: Did someone say toilet paper? Oh yes, that was me. Come see what I have designed using the cardboard from TP. Getting ready for some friendly Halloween festivities Oct 25, 10a – 1p. Fun for 8yrs and up. Join us and bring a friend. Register now! Wed evening classes: Our classes are starting back again starting Sept 3. 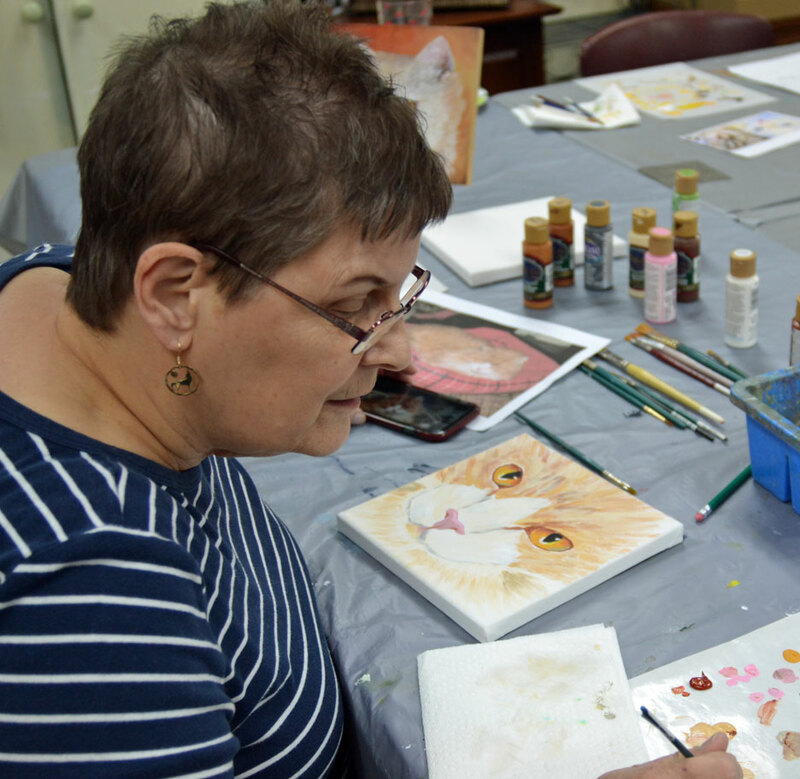 We’ll have our weekly crew working on a fall schedule for classes, but also look for special workshops as well as a chance to start our decorative painting basics. Basics- here’s another opportunity to start painting with us by joining our Mastering Decorative Painting Basics classes starting Sept 17 and continuing for 4 weeks. Sept 10, 6p-9p, join us for a 3 hr workshop, Cone Flowers. No experience needed. All supplies included. $40. Register now. Wed am classes: We’re starting back for fall with our Container of flowers, Sept 3 & 24, 10a – 2p. We’ll create our own design and add our choice of flowers. Register now. Sept 10 & 17, 10a – 2p, we’ll paint a fall Pumpkin and Visitor design. I’m working on this one right now. Register now. Kathie George seminar: Register now for our seminar with Kathie. Register and details. We have some awesome new techniques to explore with Kathie. Do you Yupo? Susan Crouch seminar: Register now before Sept 5th to secure your seat in our seminar with Susan, May 29-31, 2015, and take advantage of preregistration discounts. Registration opens to everyone on Sept 5. Details and registration. It’s time to get you entries registered for this year’s NC state fair. Entry forms need to be completed and mailed or emailed by Sept 19, 2015. Be sure to notice that the groups have changed. There is no professional group any longer. There is E/experienced, 5 yrs or more of experience, or N/novice, less than 5 yrs experience. You can enter one item in up to 10 categories. That’s all I can think of right now but watch the web site and blog for updates. Hope to see you at the studio soon. Drinking straw that is. 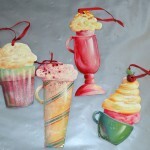 We has such fun creating with acrylic inks, acrylics, and drinking straws. It didn’t take much demonstrating until the student’s had their creative juices flowing and were ready to create their own painting. 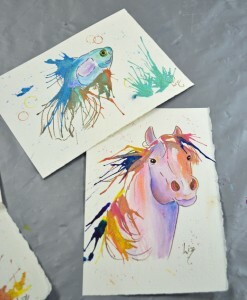 And they designed their paintings with wonderful color combinations and started puffing. I have such terrific students. I’m still playing catch up from our snow days and truthfully, I haven’t adjusted to the time change. I’m wanting to wake up at the same time which is now an hour later. 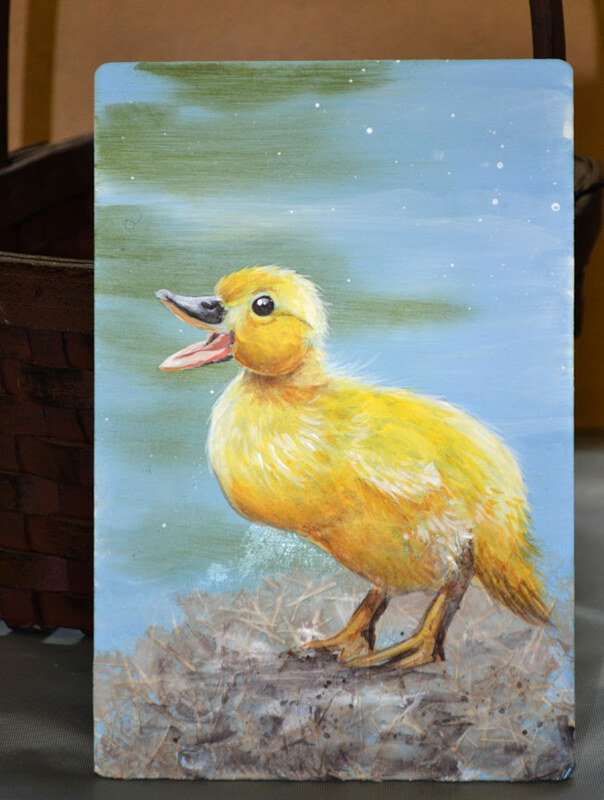 Any way, I just finished painting our Duckling for class this Saturday. This Saturday! He turned out so cute. This painting is appropriate for anyone 8yr and up, so bring your child or a friend or just yourself and come have some spring fun with me Sat, 1p – 4p. 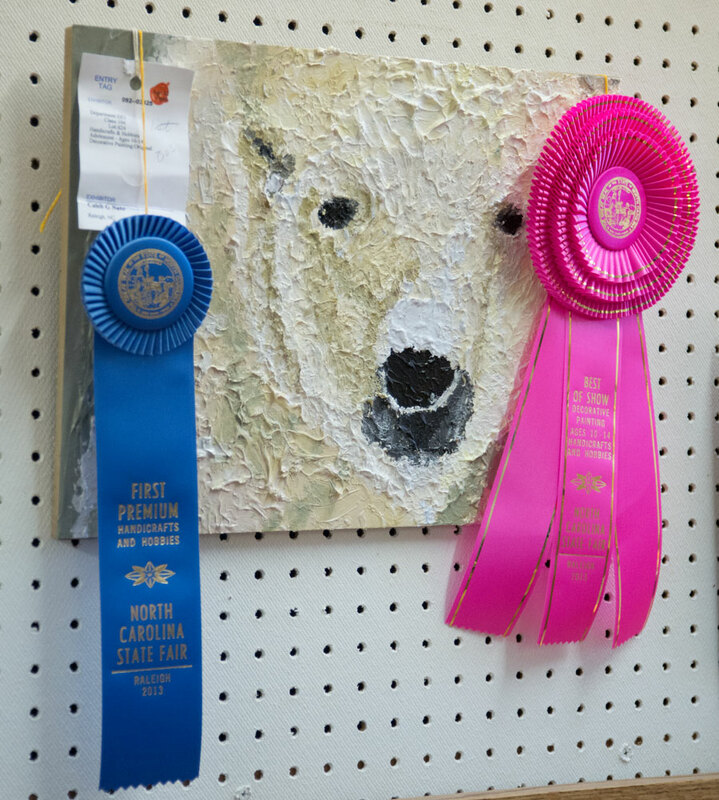 It’s exciting to see painting and art work by our younger artists at the NC State Fair. Artful Endeavors sponsors Best in Show for our younger artist and encourages them to continue with their artistic endeavors. Congratulations to the young artist who earned this year’s Best in Show.